Providing you the best range of skimmed milk powder with effective & timely delivery. Volkem Chemical offers Skimmed Milk Powder which is obtained by evaporating the water from the skimmed milk by the process of heat treatment. Spray Drying method is used to extract milk powder out of skimmed milk, which is further introduced in a chamber filled with hot air. We provide best quality skimmed milk powder which is manufactured from pure milk and have all the essential nutrients and act as a common substitute of milk. This milk powder is used in the preparations of various milk products and its add to the taste of the milk products. 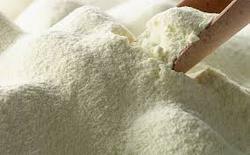 Milk powder manufactured by us is pure, refined and free of lumps. In our endeavor to satisfy various clients, we offer palatable range of milk & dairy products. Looking for Skimmed Milk Powder ?